The U.S. president will fully enforce sanctions on Tehran’s oil exports. Riyadh must pump more to prevent crude prices spiking further, which it has the scope to do. But doing Trump’s bidding will rankle OPEC peers. And the administration has a track record of changing its mind. Eight countries can temporarily keep importing Iranian oil without defying sanctions. Top U.S. diplomat Mike Pompeo says the aim is still to go to zero. With a domestic election and Saudi in a mess, it’s a way to keep acting tough while limiting the risk of oil price spikes. Beijing has resisted U.S. calls to cut crude imports once sanctions hit. 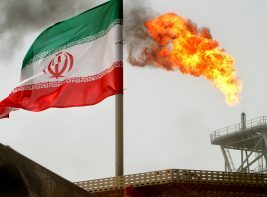 But hopes that will be enough to offset a drop of as much as 1.6 mln barrels a day in Iranian exports look optimistic. Instead, it seems to be eyeing the old playbook of public bluster and quiet reductions. The president’s Twitter attack on Tehran counterpart Hassan Rouhani doesn’t sound great for importers of Iranian crude. Yet U.S. sanctions policy is volatile - just ask Russia’s Rusal. Another Trump goal - low petrol prices - implies Iranian exports will still be tolerated. At the oil producer group’s Vienna meeting Riyadh needed to hike output without sparking an Iranian walkout. It succeeded, and in a way that could gee Saudi oil revenue. The catch is that President Donald Trump may soon twig that the deal may not help to curb high oil prices. The kingdom’s desire for oil output hikes faces pushback from Iran, its usual antagonist. Even if it strikes a deal in Vienna on Friday, lost supply from Venezuela may still push up prices. Riyadh’s saving grace could come if a trade war between the U.S. and China saps demand. The bloc took 10 days to come up with a plan that will give its companies cover if they defy U.S. restrictions. That’s unlikely to stop businesses pulling out of the Islamic Republic. The dollar’s dominance in the financial system limits Europe’s ability to offer real protection. The cartel’s biggest member, Saudi Arabia, wants oil to reach $100 per barrel. West Texas bottlenecks offer hope prices could get close. But cyclical forces are at work. Fresh pipeline capacity will unleash a tidal wave of supply. With prices high, demand will fall, too. Since 2016 the kingdom has championed output cuts that have drained a supply glut and helped spur prices. Now that the U.S. President has amped up sanctions on Iran, Saudi can fill any gap left by lower Iranian exports. What it loses on price, it gains in volume and U.S. gratitude. Politicians can offer EU companies that keep doing business in the Islamic Republic legal cover to offset the risk of U.S. sanctions. But groups wary of huge fines may still demur. And governments may not want to annoy President Donald Trump when trade tariffs are still a risk. U.S. authorities arrested the head of a Maltese bank for violating Iran sanctions, prompting calls for it to lose its licence. Similar issues triggered the recent folding of a Latvian bank. Without power to fight financial misconduct, euro zone regulators can’t keep banks safe. Donald Trump has again waived nuclear sanctions on the Islamic Republic, a short-term relief for the domestic economy. It’s also a near-miss for the European Union: fresh curbs on non-American firms in Iran could spark a transatlantic standoff. But the reprieve is only temporary. A tightening global balance of supply and demand for crude means geopolitical shocks could push up prices. Anti-government protests in Iran seem unlikely to disrupt production. A looming U.S. decision on whether to revisit sanctions could have a bigger impact. The oil cartel’s lower output was finally reviving prices before a storm knocked out around a third of U.S. refineries and dented demand. A glut of crude building up in tankers could force producers to rein in output even longer if they want to tilt the market in their favour. The world’s largest exporter of liquefied natural gas has revealed plans to increase output by almost a third. World demand for the fuel is growing but so are supplies. Doha’s dispute with its Gulf neighbours makes its new expansion projects less appealing for risk-shy capitalists. Saudi Arabia has granted the sheikhdom two more days to comply with its demands. Failure to reach a deal could escalate the dispute, hitting regional economies and investors in equal measure. But even if both sides back down, plans for greater economic collaboration are on hold. Doha’s Gulf neighbours have imposed a 10-day deadline to comply with demands including reparations, closing Al Jazeera and regular inspections. Markets have assumed the standoff won’t turn violent and impact oil supply from the region. That assumption is looking less secure. The emirate’s $300 bln-plus fund has snapped up landmark buildings and stakes in companies like Barclays and Rosneft. The spree was meant to generate returns and diplomatic clout. But Qatar’s largesse has produced few allies to help it face down its more powerful neighbours. Moscow is giving the cartel more pricing clout. A mooted deal to extend output cuts and drain global crude stockpiles can only succeed with the continued support of the world’s biggest crude producer. With U.S. drillers recovering, it may be time to make the alliance permanent. Reformist Hassan Rouhani was re-elected president in a landslide victory over hardliners. At the same time, U.S. President Trump placed the country firmly back into the “axis of evil”. The former ought to make Iran more investor-friendly, but it’s the latter that will shape its destiny.